Irritated by Muhammad Ali’s ever present boasts of “I am the greatest,” a friend asked Ali how he was at the game of golf. “I am the best. I just haven’t played yet”, replied Ali. The embargo has been lifted and we are permitted to announce that Best Lawyers® has selected four members of Astrachan Gunst Thomas, P.C. for inclusion in its 2019 Edition of The Best Lawyers in America®. Selection was determined entirely by peer review, a methodology designed to capture the opinions of leading lawyers about the professional abilities of their colleagues. Once again, Donna M.D. Thomas is included in the 2019 Edition of The Best Lawyers in America® for Copyright and Trademark Law. Frank Morgan, for the thirteenth consecutive year, is included in The Best Lawyers in America® for Copyright Law; Entertainment Law – Motion Pictures and Television; Entertainment Law – Music; Litigation – Intellectual Property; Sports Law; and Trademark Law. And, for the thirteenth consecutive year, Jim Astrachan is included in The Best Lawyers in America® for Advertising Law; Communications Law; Copyright Law, Litigation – Intellectual Property; and Trademark Law. Peter Gunst is again included in The Best Lawyers in America® Commercial Litigation. Managing Principal Donna M.D. Thomas said, “We are very pleased that our reputations are recognized by our colleagues. While this firm is obviously well-known for its intellectual property practice, its reputation was built providing a broad array of legal services to businesses with creative products. Although our practice is broader than intellectual property and advertising law (we do write “The Book” on advertising law), we are pleased to announce that we were named “Best Law Firm - Intellectual Property” by The Daily Record’s 2018 Reader Rankings. In addition, we are again the recipient of the Global Law Experts Annual Award in the category “Advertising Law – Law Firm of the Year” in Maryland for 2018. Global Law Experts is one of the world’s leading online resources for locating legal sources for services required by businesses, investors and individuals. “It is nice to be recognized for our hard work,” emailed Donna Thomas from a boat somewhere in the Caribbean Sea. “Our attorneys have experience and knowledge in a wide variety of areas, and we are delighted to be acknowledged for our efforts.” Two of the firm’s Principals, James Astrachan and Donna Thomas, are co-authors of the 6 volume treatise, The Law of Advertising and Mass Communications, published by Matthew Bender/LexisNexis. Astrachan Gunst Thomas, P.C. has a reputation for excellence in providing high-quality legal services to its clients. The firm’s attorneys have established a comprehensive range of legal practices, including, intellectual property, advertising, employment, business/mergers and acquisitions, commercial litigation and petroleum distribution law. Accolades come and go, but we are particularly proud to announce that CORPORATE USA TODAY has selected Jim Astrachan and Astrachan Gunst Thomas, P.C. as TRADEMARK LAWYER OF THE YEAR IN MARYLAND. Selection was determined by a proprietary method of analysis to rank lawyers based on their domestic and international work within their fields. Managing Principal Donna Thomas remarked, “Astrachan Gunst Thomas is proud of Jim’s and our firm’s inclusion in this prestigious listing. 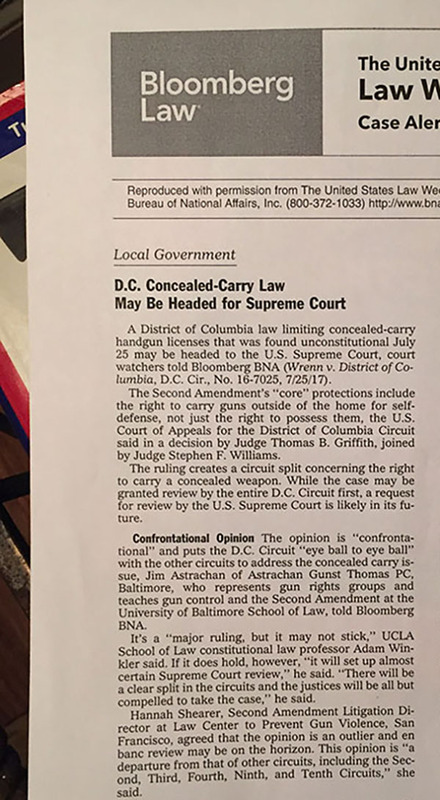 It would appear to recognize nearly 20 years of Jim’s teaching trademark and unfair competition law at the University of Maryland Carey School of Law and the University of Baltimore School of Law, the many articles written over the years, many trademark cases in various courts, and decades of representing people who promote and distribute goods and services." The embargo has been lifted and we are permitted to announce that Best Lawyers® has selected three members of Astrachan Gunst Thomas, P.C. for inclusion in its 2018 Edition of The Best Lawyers in America®. Donna M.D. Thomas is included in the 2018 Edition of The Best Lawyers in America® for Copyright and Trademark Law. Frank Morgan, for the twelfth year, is included in The Best Lawyers in America® for Copyright Law; Entertainment Law – Motion Pictures and Television; Entertainment Law – Music; Litigation – Intellectual Property; Sports Law; and Trademark Law. And, for the twelfth year, Jim Astrachan is included in The Best Lawyers in America® for Advertising Law; Communications Law; Copyright Law, Litigation – Intellectual Property; and Trademark Law. 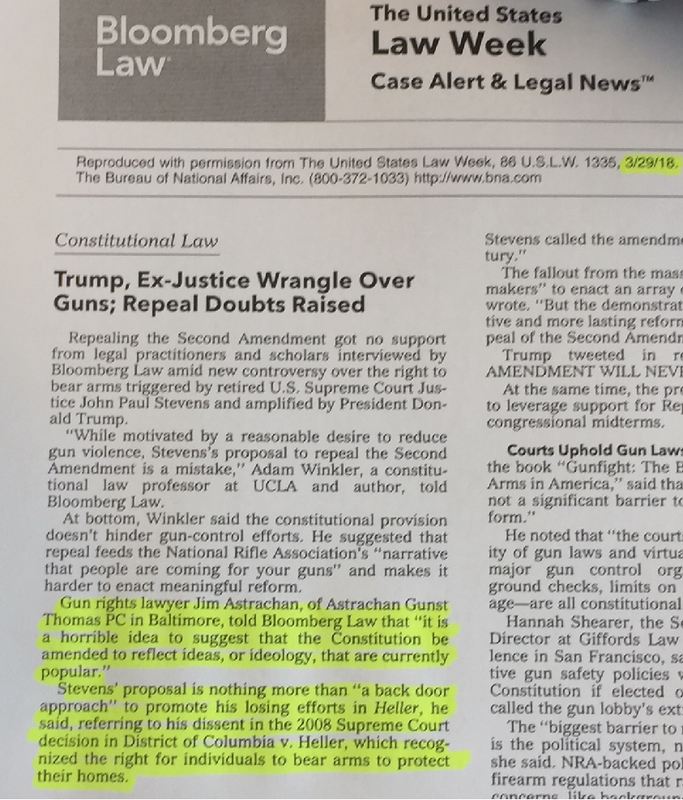 A gun case to end gun cases? We are proud to announce that Trisha L. Scott has joined our firm. Trisha is a 2017 honors graduate of the University of Maryland Carey School of Law. Ms. Scott recently completed a judicial clerkship with the Hon. Julie R. Rubin, Circuit Court for Baltimore City. Jim Astrachan commented, "Trisha is a great addition to our practice and we know she has received superior training at her last position." Gun Control Laws May Face Tougher Test If Kavanaugh Confirmed. 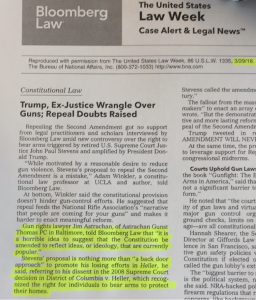 The Bumpy Road to the Supreme Court: Does the Second Amendment Prevent States From Prohibiting Ownership of Assault-Style Rifles and High-Capacity Magazines? Who Will Protect the Consumers of Trademarked Goods? A Baltimore man who filed a federal lawsuit after the Court of Special Appeals ruled police did not have a valid warrant to use cell site simulator technology to locate him is asking a judge to reject the Baltimore police’s motion to dismiss the case and allow it to proceed to discovery. 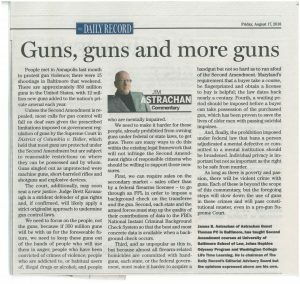 Astrachan Gunst Thomas, P.C. proudly announces that U.S. News Best Lawyers "Best Law Firms" has again selected AGT to a Tier 1 ranking among firms practicing in the areas of IP litigation, copyright, trademark, and entertainment law – music in its 2016 Edition of U.S. News – Best Lawyers "Best Law Firms." Selection was determined through client input, the community's regard for the firm's lawyers and other data. Firm Managing Principal, Donna M.D. Thomas said, "We are only eight lawyers, but we stand neck and neck with the country's most prominent, and largest, law firms. We are proud of our accomplishment, and we intend to maintain this level of excellence." Astrachan Gunst Thomas, P.C. proudly announces that the International Trademark Association (INTA) has named Firm Principal, Jim Astrachan to its International Trademark Mediators Network. INTA’s Trademark Mediators Network is the only panel of mediators with dual expertise in trademark and unfair competition law as well as the art of mediating disputes. Settlement rates for these mediated disputes reach 70%. Founded in 1878, INTA is a non-profit, global association of trademark owners and professionals, 30,000 plus, dedicated to supporting trademarks and related intellectual property in order to protect consumers and to promote fair and effective commerce. Astrachan Gunst Thomas, P.C. practices intellectual property, business/mergers and acquisitions, commercial litigation and employment law. Congratulations to MILKSHAKE, Baltimore's own rock band for kids, for receiving a Grammy Nomination for Best Musical Album for Children! The album "Great Day" was nominated as one of the 5 best kids' albums released last year. The awards will be announced on January 31, in Los Angeles, California. In 2009, MILKSHAKE also conceptualized "The Milkshake Show" for television and again toured the country playing live concerts for their fans. MILKSHAKE is represented by our very own Frank Morgan. Rumor has it Frank will attend the Grammy's but not be asked to sing. Stay tuned for our "Who are you wearing?" segment. Jim Astrachan, Donna Thomas and Frank Morgan have again been named Super Lawyers for 2010 in the area of Intellectual Property, although Frank is more entertaining. Peter Gunst was again named a Super Lawyer in the area of Business Litigation, and Julie Rubin was again named a Rising Star for Business Litigation. Not bad for a small firm. Super Lawyers named Donna Thomas one of Baltimore's Top 25 Women Attorneys. Go Donna! On March 18, 2009 Jim appeared before the House Judiciary Committee to testify in favor of expanding Maryland's Reporter Shield Law, which protects journalists from having to reveal their sources to include electronic media. Click here to read Jim's testimony. On March 11, 2009 Jim traveled to Annapolis on behalf of the MD/DC/DE Broadcasters Association to testify bin support of allowing cameras in criminal sentencing proceedings as s crime deterrent and an educational tool. Congratulations to Jim Astrachan for being named one of the Best Lawyers in America. Jim was named through a national nomination process and has been named twice by Baltimore Magazine as one of Baltimore's Best Attorneys. Congratulations to Jim Astrachan and Julie Rubin for being selected Maryland's Legal Elite by SmartCEO Magazine. Jim and Julie were nominated by colleagues, clients, business owners and industry leaders. According to the selection criteria, recognition indicates that an attorney's abilities are worthy of peer acclaim and that he or she has achieved a distinct level of excellence in the law. Apparently, the terrains of I.P. law aren't the only areas Jim's able to navigate. Now he's taking on the waters of the Chesapeake Bay and (eventually) the Atlantic Ocean. Jim's new hobby has sailed him right into the pages of Fortune Magazine's February 6th issue. The article, "Dreams Afloat" by George Sass, Jr., describes Jim's discovery of sailing as a remedy for stress. It relates how Jim began by taking certification classes and now is secure enough with the lines to bring friends and associates on board for the "three-hour cruise." Rumor has it he is always on the lookout for crew. And no one has been reported missing (yet). Jim is featured in City Paper. As President of the Advertising Association of Baltimore, Jim was unhappy with the Baltimore Area Convention and Visitors Association's (BACVA) selection of a California and Canada based agency, rather than one of Baltimore's agencies, to develop a new slogan and logo for Baltimore City. In a letter to the Baltimore advertising community, Jim expressed his strong opinions against the decision. You may recall BACVA paid $500,000 for this work, although the City Paper reported that Cincinnati got it for free from the same folks BACVA hired. You may also recall that BACVA went outside Baltimore to hire a branding agency because it did not want its new agency to be "biased." Did BACVA know that its choice, the one that branded Cincinnati, had an office in that city? Did BACVA know that "Charm City" was created by a local agency guy and given to the City for free? Who's watching these guys? The full story is available at City Paper Online.